Yesterday Larry and I didn't leave the church office until 6 pm. We had to tie up all the loose ends of work so we could enjoy some down time next week. On the way home we stopped to get groceries and then came home and I made dinner. Thursday nights are always a time for me to decompress because I have been wound up all week and on Thursday night I know a respite is coming. 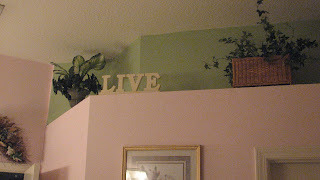 Just thought as I begin my blog tonight I'd take some photos of a few things at our house tonight. Here are some photos of my two trees...one in the living room, one in the family room. The one in the family room, below, is my little sugared fruit tree. The other one is our "family tree" with the ornaments the kids have made over the years, and gift ornaments people hav e given us. It's our "tapestry tree" as I call it. Larry took her to the bus stop, came back and woke me up and said, "let's go!" He wanted to go on a "Fun Friday" date and get the very last our our Christmas shopping done. I also had to get a nail fill so he dropped me off there and headed to a store nearby. My nail place was packed today. I normally get my nails done on my day off in the morning because the place is empty, being that my day off is on a weekday and most people don't have a day off during the week. Well, it seems everybody was off today. It was a holiday rush, that's for sure. Tom ended up doing my nails, and...he's my least favorite. However I understood - they were swamped. Actually he didn't do a bad job. He did most of the work and Lisa insisted on doing my designs. She just has a special touch with designs. A few weeks ago someone else did my designs on my toes and she came over, took one look at it and said, "no, that won't do" and proceeded to take a cotton swab with polish remover and start furiously swiping the polish off. I do have to admit, it wasn't nearly as good a job as she would have done, but I was going to deal with it. I mean, it wasn't "bad" it just wasn't "awesome." Then she proceeds while swabbing it off, to talk very fast in her language to the tech who did it and I could tell she was not pleased. Then she sat down, repolished the two toes, and re-did the designs. "There Dee-na...look goo na fo you?" After getting my fill we went to Penney's, Marshalls, and even did a jaunt into Ashley furniture, not to get anything - just to look around and see what they had since we haven't been in there since they opened. Before I left this morning for my nail place, Dustin asked if Casey and Alexa could come over tonight and I would make tacos. Of course I said yes. Larry and I headed home at about 4:30 and I started making the tacos and setting everything up for the m. Casey and Alexa came but right after they filled their plates, Alexa's cell phone rang and it was her brother saying her other brother had just broken his arm and she needed to come home and watch her younger brother. We were bummed out about that - both the broken arm, and the fact that she couldn't stay. Oh well, Christmas break is here so we'll make up for it. Alexa went home and Casey stayed here. They are eating tacos and chocolate chip cookies and watching a movie while I'm now focused on tomorrow's dinner, making a pot of chili. (I just took a photo of them - at left...) Casey isn't feeling well but let me take the photo anyway. She has a bad cold and is alternating between coughing and blowing her nose. But they seem to be having a good time. I'm simmering chili, starting some loads of clothes and blogging. Tomorrow I'll be housecleaning and don't want to cook too much. I am settling down into a few chores tonight before bed so I won't have quite as much to do tomorrow. It will be a full day of doing 4-5 loads of laundry, getting Sunday clothes lined up/ironed, cleaning our bathroom, starting to iron all the table linens for Christmas dinner (I'll have at least 10 people here), make the grocery list for Christmas dinner, and a whole bunch of other stuff from mopping floors to returning church calls, to making a few "care" calls to people in need, and then I'll fall into bed and start my extremely early Sunday morning b efore the sun comes up. But it's a good life...a very good life. We're under a Christmas crunch, but what a thing to celebrate! Jesus birth, and...look at a ll we have to celebrate with. It's AMAZING what He's given us. I never cease to be amazed at God's goodness. 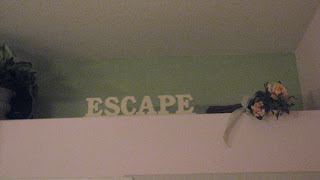 I sit in my big tub everyday, and look up on my plant shelves at my two "signs" up high that say "live" and "escape" and I think to myself, "yes, I am truly living" and "thank God in the process of living when things get stressed, I have a place to escape to, and sit in my tub with moonlight path bubble bath, my candles, and just talk to the Lord and de-stress."